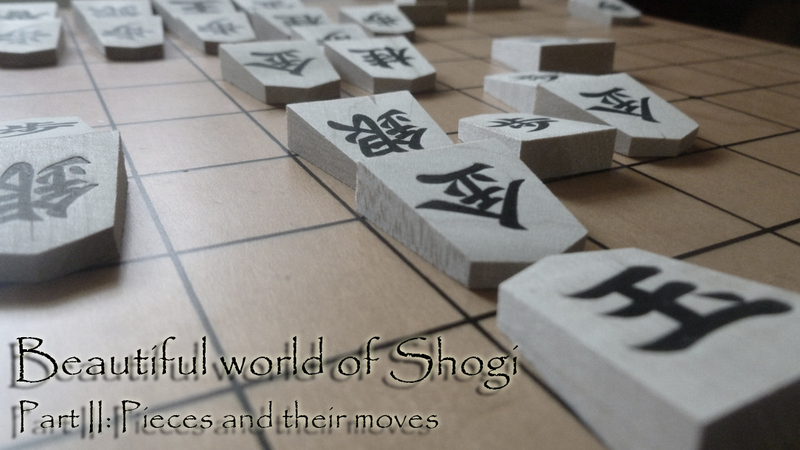 Welcome back for another lesson about Shogi, this time we move from past into present to see what pieces are on the board and how they move. For the sake of clarity and better understanding, I decided to use the design for pieces made by Filip Marek from Shogi.cz, who is also the director of Czech Shogi Association. This design combines the japanese character on pieces with the small diagram from international pieces. Pawn moves simply one square ahead and capture the same way. There is no exception from this rule - not even on the first move, where in western chess pawn might move two squares ahead. If we have a look on the etymology of the japanese characters, the first one 歩 (fu) mean walk, and the second 兵 (hyou) is soldier. Both together reads as fuhyou, which can be translated as a foot soldier. Lance is the first piece exclusive to Shogi (when comparing to western chess). It moves in a line ahead, where you can move one or multiple squares. You cannot go over the units. Same as in the case of pawn, first character 香 (kyou) means incense, smell or perfume, the second one 車 (sha) which means chariot or car - both together giving us incense chariot - a.k.a. lance (don’t ask me how…). Knight remains quite unique piece even in shogi, despite it has less variety, where it can moves. Your only option is to move in an “L” shape forward - meaning, you move two squares ahead and then one left or right. Knight is also the only piece, which can go over the other units. First character 桂 (kei) is a Japanese Judas-tree (cinnamon tree), while the second is 馬 (uma / ma) meaning horse. Probably here it’s that tress represents the pole, which knight carries on top of the horse. One of the best offensive units is Silver General. I’ll cover why’s that little bit later in some other part. This unit can move only one square in all diagonals and one square ahead. Here the etymology is simple - 銀 (gin) means silver, 將 (shou) means leader, commander or general. Gold general is the opposite from silver general. It’s one of the strongest defensive units. This piece can move only one square in a cross and two front diagonals (forward right & forward left). Same as in the case of silver general, here 金 (kin) means gold, while 將 (shou) remains the same leader, commander or general. Bishop is a second “range” unit, which means it can move more than one space. Similarly to lance, it can move one to multiple squares, but this time on all diagonals, which gives the unit more range and chance to escape back if needed. Here 角 (kaku) means angle, while 行 (gyou) is journey or going. Since bishop goes in diagonals, the meaning of angle going is pretty self explanatory. Third and last “range” unit is Rook. In a concept it’s a same piece as Bishop, but it can move on a cross (not diagonals). This time I’ll start from the second character 車 (sha) - we already had this one with lance in the mean of chariot or car, the first one is 飛 (hi) meaning fly. All together it’s hisha - flying chariot. Same as in western chess - King is the most important piece on the board. If either player’s King is captured, it’s checkmate and the game is over. It has same set of moves as in wester chess - it can move one square around. King is the only piece in shogi, which has different symbol for each player. Even if the difference seems small, it shows which of the players is - at least on paper - stronger. The second character is the same: 將 (shou) - leader, commander or general (same as in the case of silver or gold). The first character is either 王 (ou) - meaning king or 玉 (gyoku) - jewel. So both together it’s either king general (王將 - oushou) usually given the senior player or higher ranked, or jeweled general (玉將 - gyokushou). Now, when you know everything about the basic pieces, we can start to complicate things a little bit. I’ll go through the board setup, general rules and more in the next few parts, so you can look forward to it. Before I’ll part with you today, just one more explanation about the japanese characters. All the japanese symbols used above are kanji. Those are logographic characters which have been borrowed from written Chinese. Japanese has two sets of readings that are in common use: On readings and Kun readings. On readings are those derived from classical Chinese pronunciations, whereas Kun readings are native to Japanese. Which reading is appropriate to use depends on the context in which it appears. For the most part, On readings are used in compound words formed from multiple kanji. That’s the case of the most kanji used in this article. For the Kun readings, it’s are used in most cases where you see a kanji character on its own - here the only Kun reading was used for 馬 (uma) - horse.